Is it better to hire a local solar contractor, or is a national photovoltaic installer a better idea? A handful of large, national contractors handle the lion’s share of photovoltaic installations across the country. This isn’t surprising, since the industry behemoths have much larger marketing budgets and brand recognition. However, working with a professional local or regional photovoltaic contractor offers several advantages. Photovoltaic installation regulations vary widely across the United States. Each city or municipality has its own set of rules that govern permitting, connection and inspection. In addition, weather patterns and climate conditions vary significantly across the country. No two states have the same solar energy potential. Because regional installers have a full understanding of your area’s weather conditions, these solar contractors are better equipped to design a photovoltaic system that optimizes your solar energy potential. Local and regional photovoltaic contractors are familiar with the challenges for solar installations in your geographic area. As a result, a regional solar contractor can expedite your applications and inspections, providing you with more comprehensive service. Naturally, you want to save as much money as possible on your photovoltaic system installation. The most significant financial incentive available today is the 30 percent federal solar tax credit. It’s safe to say that every professional contractor knows about this benefit. But state and local tax credits, rebates and grants can reduce your investment costs even more. National contractors may not be aware of all of the specific financial incentives offered in your area. A local solar contractor is intimately familiar with all of the incentives available, helping you to keep your costs down and maximizing your solar savings. Large national companies focus on quantity over quality. The more photovoltaic installations, the better, because it’s all about the bottom line. With a local solar contractor, however, the focus is on quality and customer satisfaction. Smaller, regional photovoltaic companies thrive on their reputation and referrals from satisfied customers. This means that a local or regional solar installer will work hard to ensure your satisfaction. Regional installers also provide continuity of service. The same professional team who designs your photovoltaic system also installs it and will be there if you need further assistance down the road. National contractors, on the other hand, frequently outsource their installation jobs. So if you experience any problems, you’ll be forced to deal with multiple companies to arrive at a solution. Intermountain Wind & Solar specializes in serving customers in Utah, Idaho, Wyoming, Colorado and Nevada. We are confident that, by working with us, you will appreciate the many advantages of choosing an expert local solar contractor. Contact us today to schedule a free renewable energy estimate for your home or business. Should You Go Solar Now, or Wait? Are you ready to go solar, but wonder if the timing is right? You’re not alone. Countless homeowners throughout the Intermountain West are debating this very issue. While that may be true, the facts tell us that it makes much more sense to go solar now. If you think you’ll spend less by waiting to go solar, think again. While the prices for photovoltaic modules might continue to decline slightly, equipment costs aren’t likely to drop significantly over the next several years. What will decline, however, is the number of available financial incentives for installing your home photovoltaic system. The federal solar tax credit is slated to step down from 30 percent to 26 percent in 2020. In 2021, that number goes down to 22 percent. After that — if not sooner — the federal tax credit will be gone. State and local tax credits, grants and rebates are also steadily disappearing. Once the lucrative financial incentives for going solar are gone, out-of-pocket costs for photovoltaic installations will increase significantly. Taking advantage of something now is wiser than waiting for a better opportunity that may never materialize. Headlines touting new innovations in photovoltaic technology may tempt you to wait rather than go solar now. But realistically speaking, any new technology announced today is at least a few years and a few million dollars away from production. And many innovative energy ideas never reach the marketplace. For that reason, waiting for more efficient photovoltaic panels really doesn’t make sense. As the condition of the U.S. power grid continues to decline, the threat of cyberattack continues to grow. Even if hackers and hostile nations leave our power supply alone, a solar storm or destructive wildlife may be enough to crash the grid. Consequently, financial benefit isn’t the only pressing reason to go solar. Don’t let financial concerns stop you from protecting your home and family from potential threats to the municipal power supply. Many affordable financing options are available, making it possible for almost any homeowner to go solar today. Intermountain Wind & Solar provides photovoltaic system design and installation to commercial and residential customers in Utah, Wyoming, Idaho, Colorado and Nevada. Contact us today to learn more, because there’s never been a better time to go solar. Solar energy systems are a natural fit for schools. And thanks to the many benefits that renewable photovoltaic power offers, educational installations are on the rise. According to the Solar Energy Industries Association (SEIA), U.S. schools collectively had 303 kilowatts of photovoltaic capacity at the end of 2003. By the end of 2013, that number increased to a whopping 457,000 kW. Schools in the Intermountain West states are following this trend. The SEIA report says that 147 Nevada schools are powered by photovoltaic energy. Utah follows with 98, and Colorado has 84. Idaho has 23 solar-powered schools and Wyoming has 3, but PV installations are on the upswing in both states. So what is it about solar energy that the education industry loves so much? Energy costs are high for many school districts. Consequently, unlimited free power generated by the sun can deliver huge cost savings when compared to grid-generated power. With a modestly sized solar array, cost savings are correspondingly modest. For some school systems, however, the cost savings provided by larger solar energy systems can be staggering. Milford High School in rural Utah has a small 10 kW photovoltaic array, and saves roughly $1,500 per year. But according to the SEIA report, 450 of the districts studied could save more than $1 million each over the course of 30 years by investing in a photovoltaic energy system. School sites are typically large enough to accommodate a large solar panel array. Photovoltaic panels can easily be installed on the rooftop at many locations. Or if the rooftop is not a practical option due to structural or shading issues, a photovoltaic panel system can be ground-mounted. One of the most common mounting sites used by schools today is parking canopies. These structures are ideal for supporting large photovoltaic panel arrays while providing valuable shade for staff vehicles and school buses. Students in the United States lag behind many other countries in both math and science. By installing solar PV arrays, schools can expand their educational opportunities, helping students make greater strides in the STEM subjects. Teachers can incorporate their school’s photovoltaic system into STEM-related lesson plans for students at any grade level. Giving students the chance to explore solar power with a real-world example provides a unique opportunity to develop skills in using math and science to solve problems in everyday life. In fact, financial incentives are available in many U.S. locations for solar schools, or those that use PV systems as teaching tools as well as lucrative energy sources. Thousands of schools across the country have already adopted photovoltaic energy. For more information on photovoltaic installations in Idaho, Utah and the surrounding states, contact Intermountain Wind & Solar today. As the region’s leading renewable energy contractor, we have the knowledge and experience to bring cost-effective solar energy systems to schools throughout the Intermountain West. Gas stations running on commercial solar power is a growing phenomenon in the U.S. In 2013, a downtown Salt Lake City gas station installed photovoltaic panels to provide power. Soon after, Oregon and Vermont also became home to solar-powered gas stations. Now, a multinational oil and gas company has announced plans to add 200 megawatts of commercial photovoltaic capacity to 5,000 of its fuel stations around the world. Clearly, gas stations are increasingly becoming a meeting ground between fossil fuels and renewable energy. Electricity bills can be expensive for service stations, especially those that include convenience stores. In fact, running multiple freezers, refrigerators and lighting 24 hours a day can cost thousands of dollars each month. Adding solar panels and using free energy from the sun translates to big savings, especially when business owners can take advantage of reduced equipment and installation costs. Financial incentives make installing commercial photovoltaic systems especially affordable. Local, state and federal solar tax credits and grants, as well as rebates from professional contractors, can bring down costs by at least half — more, in some cases. Considering the high monthly electricity costs at gas stations and the decreased investment costs for solar, the payback period can be quick. A photovoltaic installation could pay for itself in just a few years. After that, it’s pure profit for the gas station owner. The average gas station has shade structures over the fuel pumps, and these canopies are ideally suited for photovoltaic panel arrays. At many service stations, these canopies are substantial, allowing for the installation of a large solar panel array. In addition, service station canopies typically have few shading issues that can affect photovoltaic output. Finally, atop a canopy, photovoltaic panels can be positioned to capture an optimal amount of the sun’s energy. This allows gas stations to create their own electricity without giving up any valuable space on the property. Electricity costs have been on the rise for decades, and there’s little reason to think that’s going to change. By installing a commercial solar power system, a gas station can lock in long-term energy savings that can act as a buffer against increased utility rates. Gas stations with commercial photovoltaic arrays are wisely preparing for the future. Every year, more electric vehicles hit the road, which means consumers have an increasing need for charging stations. Adopting solar now is a valuable step toward adapting a traditional service station into one that can provide both gasoline and charging stations for electric vehicles. Solar energy is a sound investment for service stations as well as a variety of other businesses. To learn how your business can benefit from commercial solar power, contact Intermountain Wind & Solar. We serve clients in Nevada, Idaho, Utah, Wyoming and Colorado — trust us to be your local commercial solar power expert. Can Solar Panel Glass Break? Solar panel glass is incredibly strong. Photovoltaic modules are fabricated using commercial-grade tempered glass, which is much more resistant to breakage than normal glass. However, although the glass is designed to withstand heavy use, it can break. This doesn’t happen often, but understanding what can compromise the integrity of your solar panels could help you prevent potential damage. Have you ever poured cold liquid into a hot glass or placed a straight-from-the-oven glass dish into a sink filled with cold water? If so, you likely ended up with cracked, broken or shattered glass. This is referred to as thermal shock damage, and it happens as the result of a sudden change in temperature. Tempered solar module glass, despite its strength, is also vulnerable to thermal shock. Consequently, if you need to use a hose to clean dirt and debris off your panels, you must be careful with your timing. Since the water coming from your hose is probably cold, you don’t want to wash your photovoltaic panels when the sun is high in the sky. At that time of day, even in the wintertime, the glass will be hot enough to crack. Instead, if you must spray down your panel array, do so in the early morning or evening when the modules are cooler. In fact, we don’t recommend that you use the hose to clean your panels at all, if you can avoid it. The toughened glass used to build solar panels can take a hit from a stray Frisbee or rubber playground ball. However, the impact from a heavier object, or one traveling at high speed, can break the solar module glass. You may want to warn your family and the neighborhood kids to take their baseball game to the park. And be sure to keep any nearby trees trimmed, as a falling branch could crack the glass. Solar module glass won’t break during an ordinary hailstorm, as it is tested and manufactured to withstand hail up to one inch in diameter. And even if your region of the Intermountain West gets larger hail, the chance of damage is small. Photovoltaic panels are mounted at a tilt, so they’ll typically only suffer a glancing blow. That said, softball-sized hail has been known to crack some solar modules. This type of damage is quite rare, but it can happen. Likewise, a direct lightning strike isn’t likely, but if your photovoltaic panels are hit, they will probably break. You can’t prevent weather damage to your solar array, but fortunately, your homeowners insurance likely covers breakage due to an extreme weather event. Some policies may also cover accidental damage. Contact your insurance agent to learn more. A final word of caution: If one of your solar modules becomes broken or cracked, don’t touch it or attempt repairs on your own, as you could sustain a serious electrical shock. Intermountain Wind & Solar installs photovoltaic solar energy systems for both commercial and residential clients throughout Utah, Idaho, Wyoming, Nevada and Colorado. Contact us today to learn more about how you can cut your electric bill with your own solar panel system. Are the Solar Panels Backed by Bill Nye an Industry Game Changer? Can a new solar panel manufacturing process revolutionize the photovoltaic energy industry? Bill Nye, widely known as “The Science Guy,” recently put his name behind an advanced solar technology that promises to drive down prices and create less waste. The goal is to make photovoltaic systems cost-competitive with other energy sources. This technology is interesting, but will this innovation change the future of the U.S. photovoltaic solar panel market? Silicon is the main component of photovoltaic panels, and it isn’t cheap. Plus, conventional manufacturing methods waste up to 50 percent of the silicon. The high cost of silicon and the waste ultimately lead to higher prices for consumers. The new manufacturing technology proposes using a particle accelerator. This theoretically devises a cutting and handling technique that creates super-thin slices of high-grade silicon with little waste. Less silicon and less waste should translate to much lower costs, right? In fact, the company believes that their photovoltaic panel prices may be up to 60 percent cheaper. The cherry on top? These solar modules are said to be 25 percent more efficient than the solar industry standard! But is that enough to justify waiting around for this new technology? These photovoltaic panels are not yet in production — the company is still seeking investors — so at this stage, the technology is still unproven. The company is attempting to crowdfund its equity for research and development, a process they admit is only possible with Nye on board. New technologies in any industry take years to reach the consumer market, and this one is coming from a startup. So while the manufacturing innovation sounds promising, it won’t be taking the photovoltaic industry by storm anytime soon. Today, solar panel costs are at an all-time low. And many flexible financing arrangements are available to help any household afford a photovoltaic system installation. 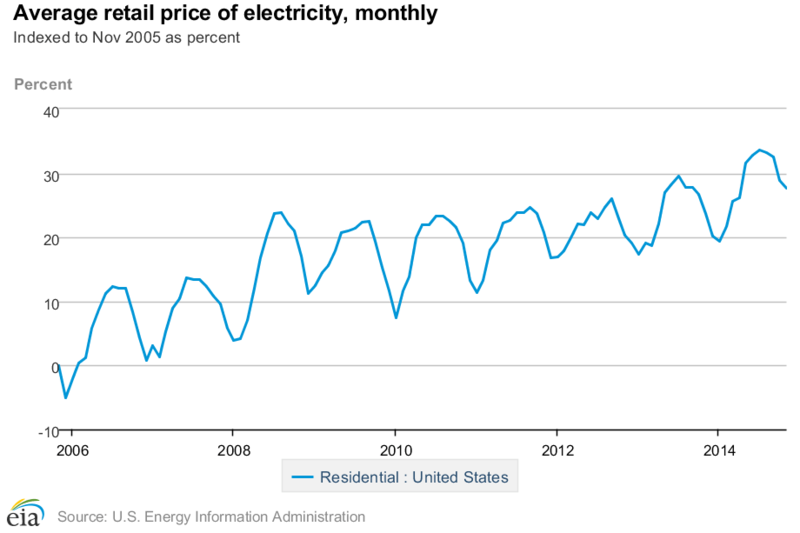 At the same time, electricity rates have been steadily rising for the last several years. Signs point to this trend continuing. In fact, the U.S. Energy Information Administration predicts that residential electricity costs for 2018 will average $13.16 per kilowatt hour, up from $12.51 in 2016. Every day you wait to install a solar panel system is one more day of paying full price for home electricity instead of using free energy from the sun. If you need another reason not to wait, financial incentives for installing a photovoltaic system are disappearing. The federal solar tax credit — offering 30 percent back on net system costs — will be gone by the end of 2021. Many state and local incentive programs have already expired or are scheduled to end this year. The sooner you get started with your home photovoltaic system installation, the greater your savings will be. Intermountain Wind & Solar provides professional system installations in Utah, Idaho, Wyoming, Colorado and Nevada. Contact us today to learn about all of your options for installing affordable, effective solar panels and photovoltaic systems. Do you know how the federal solar tax credit works? If you’ve researched rooftop photovoltaic systems, you’ve probably read that you can save 30 percent just by taking advantage of the federal solar investment tax credit (ITC). The ITC can dramatically lower your overall photovoltaic system costs. However, some information online paints the wrong picture of how this program works to provide those savings. By understanding some of the most common misconceptions about the federal ITC for home photovoltaic systems, you can be sure to take full advantage of this amazing program while it lasts. Let’s say your installation costs for a rooftop photovoltaic system total $24,000. By claiming the 30 percent solar ITC, will you get a big, fat refund check in the mail for $7,200? Instead, the ITC amount is applied against your tax liability, or the money you owe the IRS at income tax time. So while the solar ITC directly reduces the amount you have to pay Uncle Sam dollar for dollar, it doesn’t put cash back in your pocket the way you may have thought. In the example above, we see that the 30 percent credit on a $24,000 photovoltaic system installation would equal $7,200. This is only if the $24,000 amount is the net system cost. The federal ITC cannot be calculated from the gross costs, as that goes against the IRS rules. For instance, if you received any state or local financial incentives for installing your home photovoltaic system, you must subtract these before calculating the 30 percent credit amount. So for example, let’s say your $24,000 installation qualified for a state solar rebate of $2,000 as well as a $1,000 rebate from your local utility company. Your applicable net cost would be $21,000. Accordingly, your federal solar ITC would be $6,300 — not $7,200. If you calculate the ITC using your gross photovoltaic system costs, you may end up getting a tax bill from Uncle Sam. Most homeowners who install a home photovoltaic system can claim the federal solar ITC. Unfortunately, not everyone will be able to take full advantage of this lucrative financial incentive. To benefit from the solar ITC, you must owe federal income taxes. If you don’t — if you break even or end up qualifying for a refund check — you won’t be eligible … at least not this year. The good news is that, as the policy stands, the ITC can be rolled over to future tax years. So if you have a tax liability next year, you’ll be able to claim the 30 percent credit. Speak to your tax accountant or attorney to learn how to restructure your finances to ensure you can maximize this incentive. The photovoltaic energy experts at Intermountain Wind & Solar design and install residential and commercial systems in Utah and throughout the Intermountain West. Contact us today to learn more about how you can benefit from the federal solar tax credit. Your home solar battery bank may be one of the more expensive components of your photovoltaic system. And unlike most other solar components, your batteries will eventually need to be replaced. However, with proper maintenance, you can squeeze some extra life out of your battery storage bank and reduce the overall cost of your photovoltaic system. Follow these tips to keep your batteries up and running longer. Home solar batteries are designed to store excess energy for use at a later time, like at night or when it’s cloudy. But the more you use your battery bank, the sooner it will begin to run down. The first key to longer-lasting batteries is to avoid draining the bank completely. Your batteries will regularly cycle (one cycle is a full battery discharge and recharge), as you use them to provide electricity to your home. Deeper cycles (fuller discharge) can reduce the capacity and longevity of your solar batteries. Aim to keep your home solar batteries at 50 percent capacity or greater. Draining the bank further can cause unnecessary wear. To prevent deep cycles and minimize drainage, it may be more cost-effective to invest in an oversized battery bank. Additional storage will reduce the strain on your batteries, which can help your bank last much longer. Solar batteries function best at room temperature, around 77 degrees Fahrenheit (25 degrees Celsius). To extend the life span of your battery bank, keep it protected from extreme heat, and don’t let it sit outside in the freezing cold. If your batteries get too hot or too cold, they may not achieve as many lifetime charging cycles as they otherwise would. If you have flooded lead acid (FLA) batteries — the most common type — you may need to top off the fluid level with distilled water to keep the battery plates submerged. With any type of solar batteries, you must also check for leakage and corrosion on or near the terminals and cables. Finally, feel around for hot spots — one battery may feel warmer than the others, or the lugs at the cable ends could fail and get hot. If you notice any issues with any of your batteries, deal with them promptly to prevent additional damage to your storage bank. Taking care of your batteries doesn’t require a lot of effort or time, and proper maintenance can help you get the biggest bang for your battery buck. Intermountain Wind & Solar serves commercial and residential customers in Utah, Idaho, Colorado, Wyoming and Nevada. Contact us today to learn more about choosing the best home solar battery bank for your photovoltaic system. Is Off-Grid Solar Right for You? Rent an Off-Grid Home and Find Out! Switching to an off-grid solar lifestyle can be a bit of a shock if you’re not familiar with it. Although energy independence and freedom from utility bills are compelling reasons to go off the grid with solar power, this lifestyle may not be right for everyone. Will “pulling the plug” turn your life upside down, or is it the right choice for your family? Renting an off-grid solar home could help you decide. More and more U.S. residents are opting to live year-round without utility-provided power, but some families own energy-independent properties as vacation or second homes. Owners of remote hunting and fishing lodges and ski cabins in the backcountry may use their properties for only a portion of the year. For the remainder of the year, many of these solar homes are available for rent. Finding an off-grid home to rent used to require knowing the right person. But since the proliferation of vacation rental booking companies like Airbnb, that’s no longer necessary. A simple internet search can provide you with a range of options. In fact, dedicated off-grid rental search sites are popping up online today. Once you choose a rental property, plan to truly embrace the off-grid solar lifestyle. Instead of treating the time as a vacation, live like you would if you owned an off-grid home. Otherwise, you won’t get a true sense of whether a self-sufficient lifestyle is right for your family. So while you can certainly take advantage of outdoor sports and the property’s amenities, don’t just kick back and unwind. Pay attention to your solar electricity usage and the workings of the photovoltaic system. This will provide a better understanding of the solar lifestyle. In addition, take note of issues that could crop up while living off the grid, such as water shortages, transportation difficulties and spotty or nonexistent internet service. Brainstorming possible solutions can help you determine whether you should consider living off-grid with solar power. Have Questions About Off-Grid Solar Living? Reading blogs and articles about this lifestyle can provide you with answers to some of your questions. Speaking to people who live off the grid is also a great way to learn more. But don’t believe everything you read or hear, because myths and misconceptions abound. The best source of information regarding powering a home with solar energy is an experienced professional contractor. The experts at Intermountain Wind & Solar can tell you everything you need to know to decide if installing a photovoltaic system and living the solar lifestyle is right for you. Visit our website or give us a call today to learn more about grid-tied or off-grid solar power.